Attend any marketing conference and you’ll hear one word again and again (and again): Millennials. They’re the group that’s 75.4 million strong and spending $200 billion annually. 32% of them may still be living at home with Mom and Dad, but they’re a Housewares brand’s best chance at a strong future. But while climbing over one another to reach the coveted Millennial audience, most marketers have forgotten about one key demographic. It just so happens to be the group that holds 83% of household wealth and generates $5.6 trillion in consumer spending each year. Making the opportunity even greater, only 10% of advertising dollars are currently aimed at this demographic. So what is this group that most marketers are all but ignoring? This year at the International Home and Housewares Show (IHHS,) AIMsights presented on the myriad myths surrounding the Baby Boomer generation, teaching marketers how to be BoomerSmart in today’s economy. One of the most prominent Boomer myths we discussed is that they’re downsizing during the next stage of their lives. In reality, Boomers are simplifying, rather than downsizing. As a result, they have an eye for function and purpose and are very intentional with the products they bring into their homes. We walked the show with a Boomer-friendly lens, searching for products that fit seamlessly into their homes and satisfy their changing needs. With Boomers’ keen eye on function, the Joseph Joseph booth was one of our first stops at IHHS. Joseph Joseph is always a step ahead of the curve by focusing on smart design with an emphasis on high function. The helix potato ricer is perfect for the new potato and cauliflower rice trends. It provides health-conscious Boomers with an alternative to carb-filled rice and makes preparation easy. Instead of traditional ricers that require a pushing motion, this new design cleverly uses a twisting motion that multiplies force, to allow a powerful grinding action with the turn of a wrist. What drew us to these bowls is how beautiful they are, with their translucence and unique marble-like appearance. We were surprised to learn what they’re actually made of: resin. These lightweight bowls are ideal for Boomers who love to entertain. When filled with food, ceramic, porcelain, and other materials can get very heavy. These resin bowls are light and easy to maneuver, yet are absolutely gorgeous at the same time. Their function is wonderful, without sacrificing form. Boomers have embraced the Marie Kondo concept of decluttering — and the idea that using a product must bring joy. They are looking for products that go beyond simply performing a chore for ones that also include an emotional experience. The Koziol booth was full of designs that made us smile — but none more so than these spatulas. The smiley faces add a fun factor to the product, yet the fun doesn’t come at the expense of quality. The spatulas have a great weight, wonderful hand feel, just the right edge, and can withstand high temperatures — making them a functional product that brings joy. As they age, Boomers are looking for products that promote safety in the home. The PL8 Professional Slicer fits the bill, providing all the function of a traditional mandoline in a safe, easy-to-use way. Unlike other mandolines that require manual removal of the blades that must be washed by hand — a very dangerous ordeal — the PL8 product is dishwasher safe, with blades that can be switched without removing them. There’s also a stopper function to prevent the possibility of overshooting the slicer and nicking the user’s hand. Not to mention, the handheld product has a very small footprint and an adjustable blade for various slicing widths. It’s an utterly practical tool for the modern Boomer kitchen. They may not be digital natives, but Boomers are certainly digitally engaged. 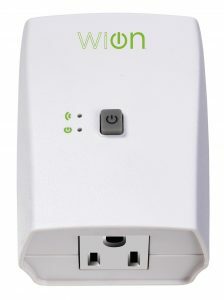 74% own a smartphone and the group is very positive about technology — linking their smartphones with freedom and connection — as opposed to other generations who view them as a “leash.” The Wion WiFi outlets make Boomers’ lives easier (and safer) by giving them the power to control their outlets with their smartphones. They can remove the fear that they’ve left the curling iron on and shut the outlet off with the touch of their phone screen. The product also allows them to turn lights on and off with a tap, to increase safety when walking around at night or ward off intruders when staying out-of-town. With plans to integrate with Alexa and Google Play in the near future, this product will continue to fit in Boomers’ technology-driven homes. Boomers, with their strong focus on health and wellness, are driving the multi-generational “healthyish” trend. 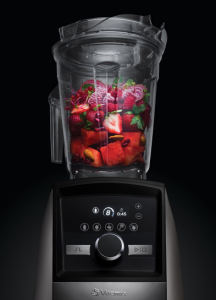 Vitamix’s new Ascent series blender with its interchangeable blender cups help make a “healthyish” lifestyle easy. Boomers no longer have to store and clean a huge cup every time they want to make a smoothie. They can attach the 20oz cup, make their healthy drink, pop on a travel lid, and take it to go. 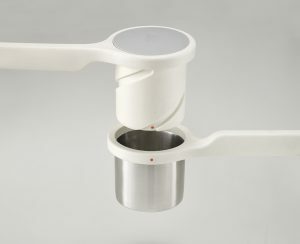 The versatile model offers a range of cup sizes so Boomers can use the product in many ways, including making organic baby food for the grandkids. Simplicity-craving Boomers are asking themselves “how can I have the same experience without so much work?” These plates and napkins look and feel absolutely fantastic, but can be thrown away after use. It’s an easy way to cut down on work while entertaining without sacrificing a drop of style or elegance. We were shocked at how fashion-forward these designs looked — we couldn’t believe they were disposable! The products come together to create an inviting, multi-layered table. The endless color and pattern options also allow for versatility and an ever-evolving look. Every day, it seems another health report is published on the dangers of chemicals in the home. 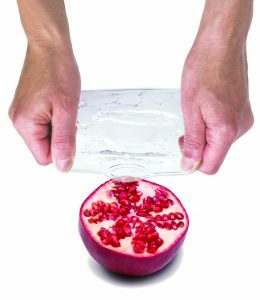 CoverBlubber — with the new clear color launched at IHHS this year — give Boomers a healthy way to preserve leftovers. The covers do not contain BPA, Phthalates, or other harmful chemicals, a desirable feature for the Boomer audience. In addition, the covers eliminate the need for dozens of storage containers. Boomers can simply leave food in their bowl or serving dish, pop on the blubber cover, and stash it in the fridge or freezer. Simplification wins again! The metal and glass exterior of these vases provides a striking, modern look. But their true beauty comes from how easy it is to make a bold style statement. 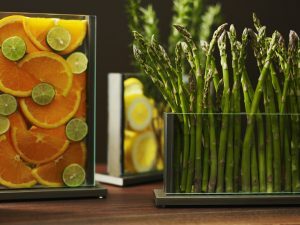 A single line of sunflowers, a pile of stream pebbles, sliced lemons submerged in water, even a row of asparagus look glamorous when displayed in these simple containers. Stems Vases allow the user to create a variety of designs — without spending hundreds at the florist for a complicated bouquet. We also love the low profile of the design, perfect for actually seeing your guests at the table. Again, function and form combine for a fantastic product. Boomers are discerning customers — wanting to have their cake and eat it too, when it comes to design and function. This handcrafted tableware line provides the sense of everyday elegance that experience-conscious Boomers crave. 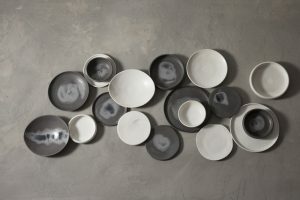 The Cloud Terre line feels personal, as no two glazes are exactly the same. Pieces feel special and custom, yet they don’t have to sit in the cabinet for special occasions — they can be used every day to bring joy. Which item would you most like to have in your home and for what reasons? If you’re a Boomer, what other products are you searching for in this stage of your life? Or, if you’re a Millennial or Gen-Xer, which of these products would fit equally well in your home? The Vitamix and Blubber Cover both really stand out to me from this list. Both seem so practical for so many uses and their relevance definitely spans generations. In my particular situation, my husband and I, as Millenials, are constantly interacting with my parents who are Boomers. We rely upon my parents to help us with our baby while my husband works outside of the home and while I work from home. This sort of interaction means that my parents will utilize our kitchen on a regular basis and it also means that we share a set of goals and values throughout our interactions. Something like the Vitamix would be so helpful in our home because while my husband and I are inching more and more closely toward a vegetarian lifestyle, my parents are also paying much closer attention to their food consumption and their weight loss goals. To have something like the Vitamix, that would allow for use amongst various people with various goals, would be super helpful in our very busy kitchen. Additionally, the Blubber Covers are really intriguing as well. Because so many people are moving through our house at any given time, we’re bound to be making enough food for leftovers. In our house, across generations, we’ve all become a lot more environmentally focused and this seems like both a super convenient AND super enviro-friendly option for food saving. I like the Progressive PL-8 slicer because of the safety feature and dishwasher safe use. I also like the coverblubber. I have a lot of Pyrex dishes with plastic lids and over time the lids are torn. These covers will be ideal as replacement. Last but not least is the vitamix blender. Like the idea of having different cup sizes. #2 – Resin Bowls. How beautiful! That would instantly attract my eye, if I was seeing this online or in a store. The picture shown is a great color and it looks perfect for entertaining. I would thoroughly enjoy a collection of these. Not just for kitchen use — they would make great visual pieces around the house. #6 – Blender – What a great idea. I can attach a 20 oz cup and blend and take it to go? This not only eliminates unnecessary double clean-up; however, it is so convenient. Kudos to Vitamix for coming up with a time saving idea. 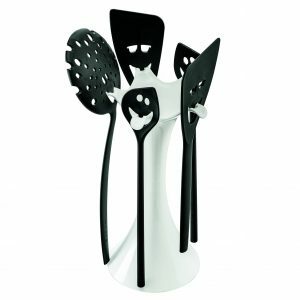 #3 – Utensil Stand – Honestly, this is adorable. I would be happy to display this in my kitchen. What a fun and useful concept. No more boring kitchen tools that you feel like you have to stuff away in the nearest drawer. This one is out for conversation! My husband and I are very much into cooking and would love to try a high quality blender like the Vitamix! We very much enjoy making drinks for ourselves and friends and I’m sure our son would love to try out a (healthy) smoothie. The PL8 Professional Slicer also sounds like a fun thing to try. I’ve always wanted a mandolin, but they scare me and seem like a pain to clean. The fact that this one is super safe and can go in the dishwasher makes it VERY appealing! 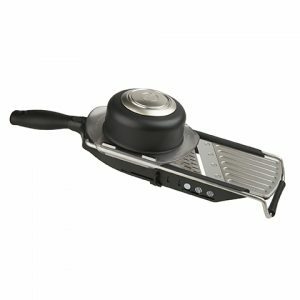 I think that the Helix Potato Ricer appeals to me as it provides a chance for alternative to carbs as well as a focus on simplicity and function with great design. 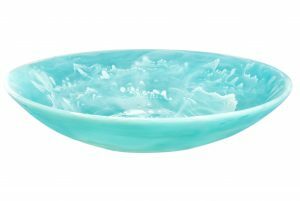 For many of the same reasons, a millennial may also like these resin bowls, as they are light and appear to be versatile. Once again the interest in form and function appeals to me. I will say that this set and was very amused. It reminded me of the “Nessy” Ladle by Anima Causa. This looks neat and would help me as I like simplicity and to de-clutter my kitchen. Given limited space in my Kitchen, this would be both fun and would allow me to get rid of several utensils. This looks pretty similar to the Kitchen Aid slicer that I bought at Costco a year or so ago. It is nice to not have to deal with changing blades that could be dangerous. I have at least two scars to prove it. I do not see this as a game-changer, but it does look pretty slick. I love practicality. As a fan of the smart phone, I support and would be interested in this item. I love my nest and my Amazon Echo, so this resonates. I think that this would be a nice addition to my smart home and it seems pretty simple. I know this would appeal to my parents, but also to people that want to maximize the efficiency of their home. I think you could say the same about the desire for health and wellness for Millennial. I love my vitamin but this seems like it is the next step. I only have the ability to make large quantities in my current vitamix that I got for my wedding. The fact that I could make small portions and then go is pretty great. I could see myself using this often. Similar to the need to make organic baby food for grandkids, this would be great when I have a family. This was actually a consideration when we decided that we wanted a vitamix. Again, this seems to meet my needs as I prize form and versatility. This is nicer than the stuff that I see in Safeway. I know my wife fusses when we have people over and this stuff is the type of stuff that she would love and would keep me from having to do a ton of dishes as well as allow us to have easier cleanup. This is a pretty cool way to ensure that I can keep things in the fridge in a way that will make it last but keep my family and I health. We are trying to minimize chemicals in our lives and have switched to stainless steel pans and BPA free plastic. I love something that will ensure that I remain healthy and that can also look cool and be useful. This is pretty cool. It is pretty unique and different and I think that it would be something that would be pretty cool for entertaining. I think that Millenials are still big on entertaining and I know put a focus on how we display our food. I think that the caring and attention to detail are timeless and is still important to my generation. I like this product because it is unique and allows me to personalize my service and to simplify my life. I like high design that has function and allows me to feel like I am able to customize my tableware. I also like that I can use these items all the time. I think that this is just as appealing to Millennial. Overall I think all of these items would work well in my home. I think in particular the Vitamix, the Horizontal Vase, the Tabletop Pottery, and cover blubber. These items have multiple uses, allow me to be healthy, and are cool in terms of design. All in all, I would say that it seems like Boomers, Gen-X, and Millennials have a ton in common, in fact more than I thought.